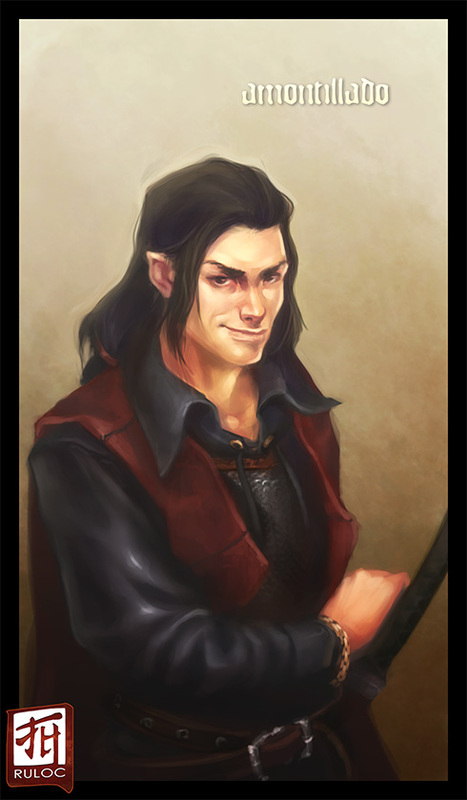 'Monty' Amontillado is a half-elf rogue big on muscle and big on charm. The sort of roguish bad-boy that all the mother warned their daughters about, Monty looks like a romance novel cover model come to life. Had he been born on Earth instead of Golarion, his dark and swarthy looks would give clear indication of his mothers Italian ancestry, offset with some of the finer features of his fathers Elven blood. His hair is raven black in colour, from the slicked back and tied into a long plait. TLDR - Ultimately he's a pretty physical guy, a Rogue Thug with big Str and a very respectable Cha stat (and the Charming trait). He's half elven, dark hair, dark features, has an elven curve blade, and is generally a well dressed Sczarni - well dressed medieval mafiosa. His chain shirt is masterwork. I guess for 'dark and smouldery looks' you might consider the Jake Gylenhaal Prince of Persia, or just look for any bodice ripper romance novel with 'pirate' or 'rogue' on the cover - its all swarthy looks and 5 o'clock shadows on chisel jaws and flashy biceps under manly (yet elegant) eyebrows with smouldery eyes.